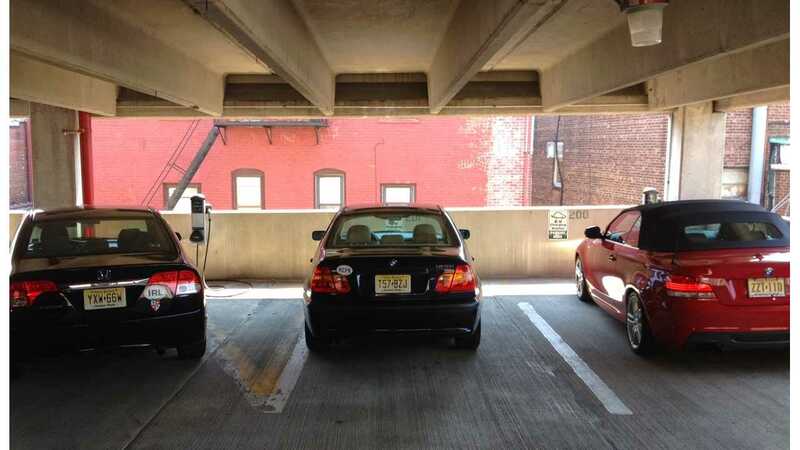 The charging stations at the parking garage in Montclair, NJ are frequently ICE'd. This is a common problem across the country. Quick Charge Power has a solution: The JLong. If you drive an electric vehicle and rely on public charging infrastructure, then you've most likely come across situations where the public charging station you arrived at was blocked by a car that isn't plugged in. At the very least it's frustrating, and at the worst it's disastrous if you absolutely need to charge in order to continue driving that day. When an EV owner pulls up to a charging station and a gas car is parked there, they call it being "ICE'd," referencing the Internal Combustion Engine of the car blocking them from charging. However this unfortunately isn't only happening with ICE vehicles. 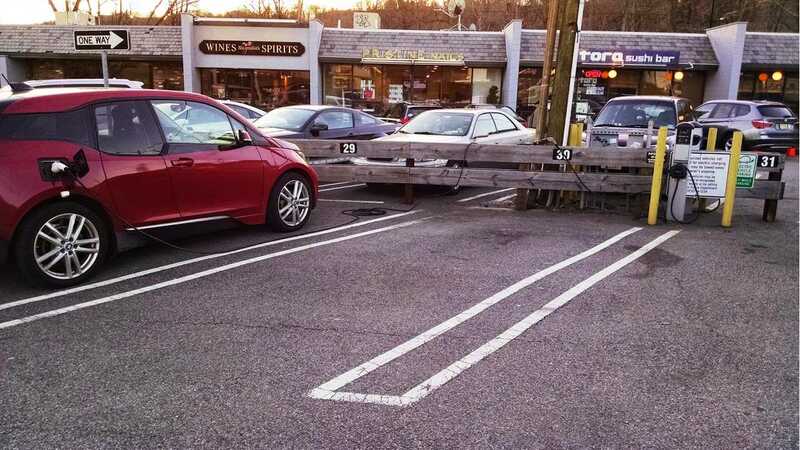 Now that electric vehicles are increasing in numbers and parking is always a premium in some locations, some EV owners are using the charging station spaces to park, even when they don't have to plug in. In my opinion, this is far worse than when the driver of an ICE vehicle parks there because the EV owner should know better. In any case, the person blocked from the charging station is terribly inconvenienced. *Editor's Note/Disclosure: Tom doesn't work for Quick Charge Power, and this post also appears on Tom's blog (check it out here). No money/compensation exchanged hands for this review. Tony Williams, part-owner of Quick Charge Power does have a relationship with InsideEVs, comments frequently and occasionally writes articles, as does Tom Moloughney. 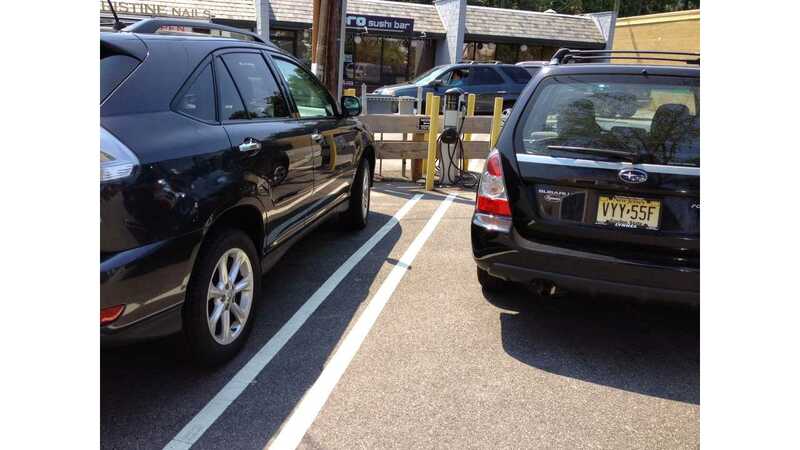 A) Wait for the person to move their car so you can pull into the space and plug in. C) Call the police and have the car ticketed and towed, but only if there is specific signage allowing that, which isn't the case for most public charging locations. These options are time consuming and bothersome, and there's no guarantee that the car will move in time to allow you to charge as much as you need to. To illustrate how the JLong works I chose to use it without cars blocking the camera's view. You can see I was easily able to park one space away from the EVSE and with the extra cable coiled up on the ground in front of my car I could have definitely even parked another space away and had plenty of cable to reach. 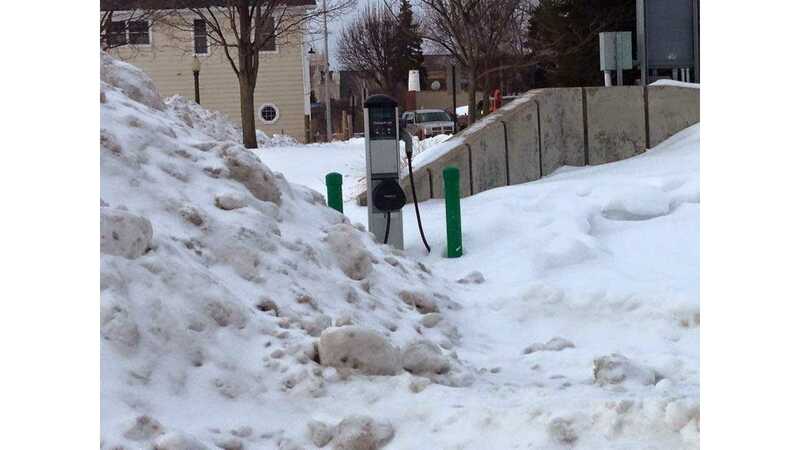 Then there is another issue that sometimes creates problems for public charging stations; the snow. When snow plow crews clear parking lots they push the snow wherever it's most convenient, and where there is room to accommodate the piles of snow they produce. Often that's where the EVSE's are located. I own a commercial property that had two ChargePoint EVSE's and I can say first hand they present a problem during the winter months. I want to keep them clear and accessible, but that's not always possible, especially when there are frequent storms with a lot of snow like we had this winter. 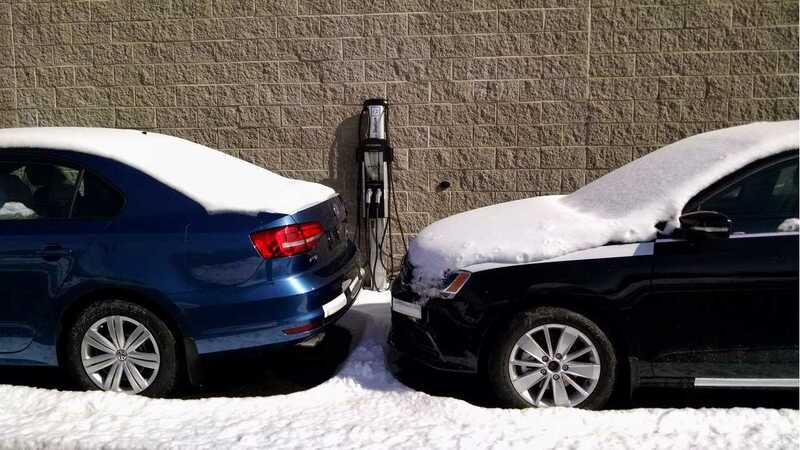 I do my best to clear a path to the EVSE's but the cars still need to park much further from the charging stations than they usually do, and if they don't get to park in the spot closest to the EVSE the cable won't reach the vehicle. This isn't all that uncommon during the winter months in areas that get a lot of snow. Without a product like the JLong you'll never reach your car with that cable. Photo credit: Chevy Volt Owners Facebook group. Now there is a simple solution that will instantly solve the problem in many of these frustrating situations and it's called the JLong. 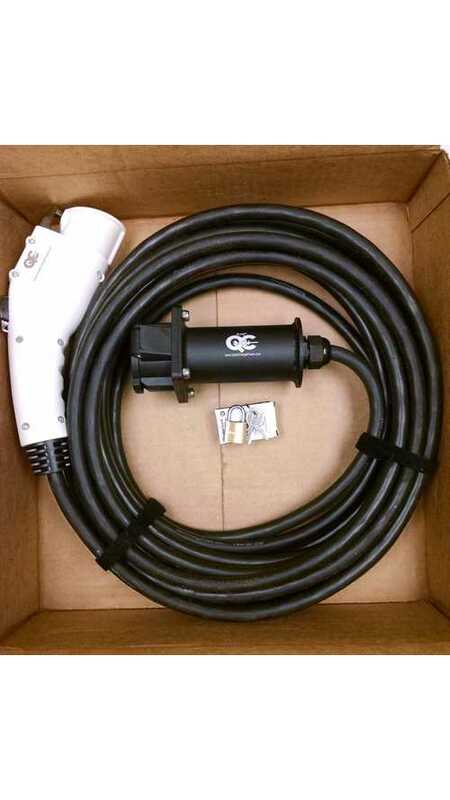 You plug one end of it into the connector from the EVSE, and the other end has a J1772 connector that plugs into your car. Available from Quick Charge Power the JLong is an extension cord for electric vehicle charging stations. It is compatible with the J1772 connector which is the connector used by all modern highway-capable electric vehicles sold in North America with the exception of Tesla. Tesla however provides a free J1772 adapter with every car they sell so this can also be used with Tesla vehicles. The JLong can be custom ordered with any length of cable, but comes standard with lengths of 10, 20, 30 and 40 feet. Personally I believe the 20 foot cable is adequate for most situations, but it wouldn't hurt to have an extra 10 feet just in case the first available space is a couple of spaces from the EVSE. You'll regret not spending the extra money for a longer cable if you come up short one day. Since most parking spaces in the US are 8 feet to 9 feet wide, a 20 foot JLong, combined with the EVSE's cable will allow you to park three spaces away from it and still plug in. For every ten feet of cable you add, you can park in one space further and still plug in. The basic JLong comes with a 10 foot cable and costs $199.00 and every additional ten feet of cable adds another $50 to the price. The JLong is made in the US and appears to be very well made. There are other J1772 extensions on the market but the JLong seems to be the highest quality one that I've come across so far which is why I'm comfortable recommending it here. I even know one person who bought a similar product from another company and returned it because they didn't think the quality was up to par. They then bought a JLong a couple months ago and have been very happy with it. "...Our second generation JLong, has a custom handle (see photo) built of 6061-T6 aluminum alloy and TIG welded. It is powder coated with a special "grip" feature and is laser etched with our logo. We use a special 8 conductor cable assembly built to our unique specification for maximum flexibility and light weight.The entire assembly will be good for up to 40 amps. All power conductors are professionally crimped to military and aerospace specifications. We don't use alloy aluminum handles, custom cables and mil-spec professional crimps (amongst many other features) because it's cheap. We do it because it's the best. Our new price with all these features is now $199.00 for 10 feet. Each additional foot is $5. If somebody were to run over your JLong in the parking lot, there's a good chance that the host J1772 plug will be destroyed and your JLong just might still be usable." Even BMW dealerships have ICEing problems. I recently stopped at this BMW dealership in NJ for a quick boost and found the EVSE blocked. In this instance I could have reached the cable but then I'd be blocking the lane for cars to drive by. To make matters worse there were plenty of parking spaces open for the dealer to park the cars within 30 feet of this but they blocked the EVSE anyway. The JLong gives you a lot of flexibility on where you can park and still plug in. I come across a lot of products for electric vehicles, and this is one I can honestly say is a must have for those who rely on public charging. It's a high quality unit, made in Kennewick, Washington and appears able to withstand the rigors of being used in public places, stepped on and even possibly run over. Both ends have covers to prevent snow, mud, etc, from getting in should you drop it and it has a custom built, 4th generation design cable built in Ontario, California USA. In most cases it will allow you to avoid being blocked from plugging in, so you can continue on with your daily activities and not worry about how you're going to make it to the next destination, or even home later that day. You can order a JLong from Quick Charge Power from this link.